Or average expected profit (or loss) per trade taken. So say you know the theoretical or historical expectancy of your system. What could really happen when you start trading (or keep trading)? How many losses could you possibly see in a row? How many losses will you get in a row on average? What happens when the law of large numbers meets a relatively small number of trades (like 200)? 2) Given uncertainty bands that are representative of different probability outcomes over small trade samples. Back to the example: How about with 3 flips? There are 8 possible and equally probable outcomes now: TTT, HTT, THT, TTH, THH, HTH, HHT, HHH. Now we’re getting more complicated. If you guessed heads each time, you could end up with 0 wins, 33% wins, 67% wins, or 100% wins. Not exactly 50/50, but better than the results for 1 flip. Lets move on–what about 200 flips? Rather than do that by hand, I used my Monte Carlo Analysis tool. This tool simulates a series of occurrences to get the outcome distribution, then does it again and again, as many times as you specify. Each simulation is a randomized outcome based on the odds of each result happening (win or loss) over a series of trades. If you repeat the simulation many times, the variations of outcomes can be seen. We let “reality” present itself rather than try to predict and model what will happen. That’s what Monte Carlo methods are all about. 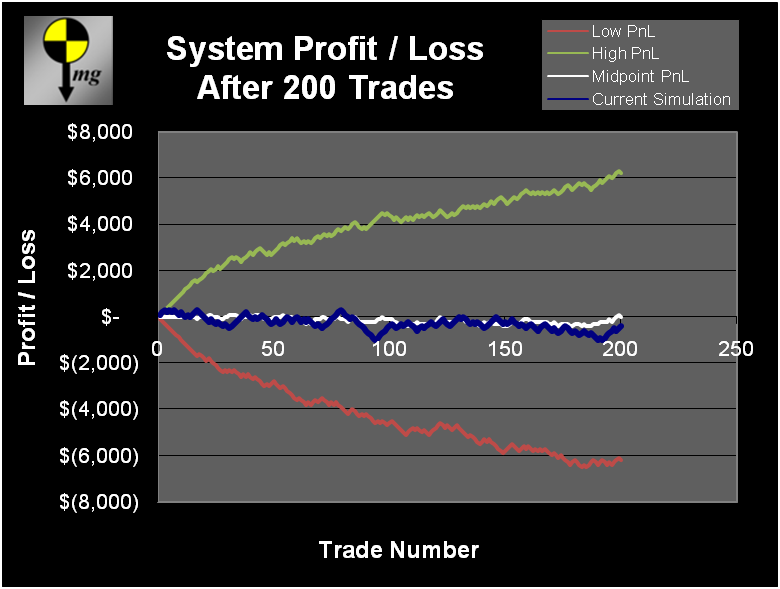 Each point of the green line is the peak net profit encountered for that trade over all 100,000 simulations. Similarly, the red line is made from the peak net losses encountered at each trade. No one outcome distribution matched either of those lines. Rather, it is a composite of all 100,000 simulations for each of the 200 trades taken. Most trade outcome distributions will fall within these lines, though they may touch them at some point. The probability of reaching this envelope is much higher in the beginning few trades, and gets less and less likely as you get more and more samples and the law of large numbers kicks in. The white line is the simple midpoint of the high and the low PnL lines. 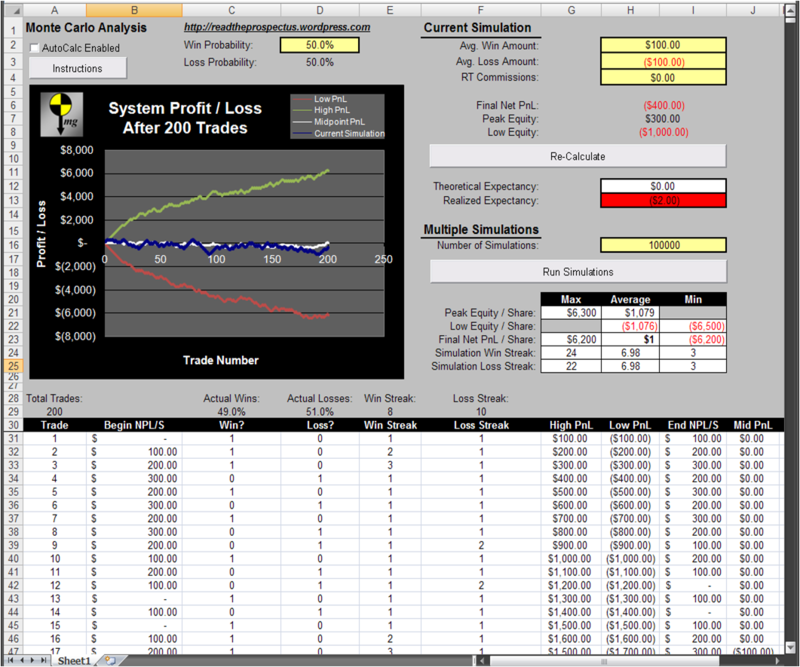 The blue line is the current outcome distribution for the last 200 trade simulation that has been run. As you can see from the overview picture, over our large sample size (20 million coin flips overall) the simple median outcome distribution is very near 50/50, though any random group of 200 outcomes can end up above or below that. Also, note that the largest losing streak encountered was 22 in a row! The average losing streak was 6.98, meaning that over 200 trades with these probability parameters, it is common and actually likely that you will see at least 7 losses in a row. If you risked 15% of your capital on each trade, you would have even odds of blowing out your account. If you risked only 7% of your capital per trade, you would on average experience at least one 50% drawdown at some point during the 200 trades. Also note that every single simulation had a losing streak of at least 3 in a row. So if you get three strikes, you’re not out, you’re just living in the world where reality meets probability. Seven losses in a row? Par for the course for flipping 200 coins, on average. All 50/50 theoretical odds, yet you can be a net winner, a net loser, or some of each over a finite number of trades. This also says to me that a small edge, e.g. 55% win, 45% loss, is no better than random chance over small (i.e. real life) sample sizes. High consistency beats sporatic home runs, hands down. Ouch. Did you “expect” that outcome? BOOM HEADSHOT! The need for systemic risk management becomes clear; you need to know more than just “where’s my stop loss on this next trade”. You also have to size your positions to withstand the likely string of adverse outcomes (commonly known as a run of bad luck). You must also forge your psyche to withstand the losses or wins that will probably come to you in groups. Again, this is for me as much as it is for you. In summary, if you make something like 20 million trades, your results should match your expectancy, and your broker will be rolling in a pile of money. If you take a more realistic number, like 200, not so much. All because probability is an average over very large samples, while each trade is a binary: 1 or 0, all or nothing. 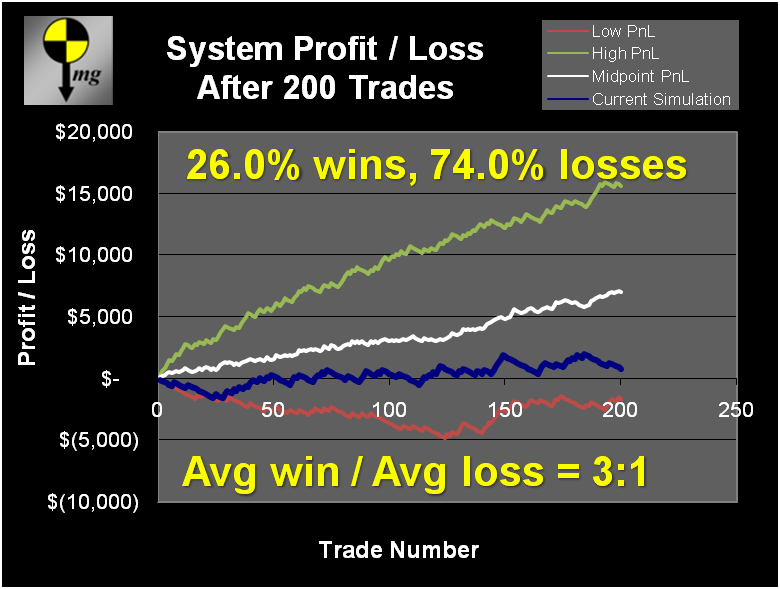 So what sort of variance could you see with your current system’s expectancy? What edge do you need in terms of win rate vs. loss rate, and average winner vs. average loser in order to make sure you don’t draw down your account dramatically? How much (or how little) of your account should you risk per trade to deal with the number of losses in a row your system may (and probably will) encounter? Download MonteCarloAnalysis.xls* and find out! Remember to enable macros. This entry was posted on April 2, 2009 at 10:40 am and is filed under Tools, Trading System Development. You can follow any responses to this entry through the RSS 2.0 feed. You can leave a response, or trackback from your own site. Great stuff! I’ve played with a few of these simulators and this is one of the better ones. Nicely written up. I think I’ll be hanging around here some now that I’ve stumbled onto it. Hey, Cuervos, glad you’re here. Your scripts, and excel samples are a great addition to TOS’s limited thinkScript docs—Which I am struggling through. Your blog and commentary are first-class. David Aronson’s, “Evidence Based Technical Analysis”, Wiley, 2006. Chapters 4-6 will **REALLY** complement the work you have done on the MC generator. I’d be interested in your thoughts (if you can find the time) on Aronson’s methods. I can see no way to implement Aronson’s work via thinkScript within TOS. Thanks again for untangling the thinkScript juggernaut! When I increase comm size, I get BETTER results. It appears that comm should be negative, but the worksheet does not allow me to enter negative values. Negative values should show up with (parenthesis) around them. Is it doing that?